Public speaking is often listed in the top spot of what people fear the most, even above heights and spiders. However, it is a great way to get your message to your target market to build your business. Further, done right, public speaking can become an additional income stream. Allow you to show off your expertise - People are more likely to hire or buy from you when they have proof you know what you're doing. Informative speaking offers education, instruction, how-to or information. For example, a virtual assistant might do a talk how to outsource work. Persuasive speaking promotes a specific viewpoint on a topic. For example, a virtual assistant might discuss why outsourcing is necessary to have a profitable business. Entertaining speaking is designed to amuse and entertain audiences. For example, an annual corporate event might hire a comedian. For the most part, when people think of public speaking, they think about speeches, but there are several different types of public speaking you can do. Keynote: These are usually highlighted talks given at events. They are generally 30 to 60 minutes long and relate to the overall topic of the event. A keynote can be informative, persuasive and/or entertaining. Seminar: This is an informative talk designed to educate the audience. A seminar can be 30 minutes up to a full-day. Workshop: Workshops are similar to seminars in that they educate, but usually have more hands-on involvement by they audience. Workshops are usually an hour to two hours long. Training: Similar to seminars and workshops, trainers also educate. They’re usually hired by corporations to teach a specific skill such as how to use social media or a sales technique. Trainings can be an hour up to a full-day, or even cover a few days. Panel expert: Many events have panels, in which a group of speakers with the facilitation of a moderator cover a specific topic. Panels are a great way to get started in public speaking if you’re timid about talking in public. Panels are usually informative, and are 30 to 60 minutes long. To get started in public speaking as a marketing method takes research and planning. Here are the steps to follow. 1. What does your market want or need? Building your business through public speaking starts the same way any other marketing tactic does; determining what problem you can solve for your target market. What does your business do that helps people? 2. Plan a talk around one of your solutions. Because it can overwhelm an audience to try and cover everything in a topic, and the goal is to generate sales leads, focus on one aspect of the topic. You want to provide enough information that people feel like they got something out of it (especially if they paid), but not so much that there's no reason for people to want buy from or hire you. For example, if you’re a virtual assistant, plan a talk around how outsourcing can increase sales or profits. Most speakers undervalue their worth and don't charge enough. With that said, as already mentioned, sometimes you may need to speak for free or cheap just to get the experience. In general, keynotes and talks with businesses can pay more than you might get for a seminar or workshop with smaller organizations. Trainings, in which you're hired by a company to teach the staff, can pay pretty well too. However, don't dismiss panels and smaller speaking gigs, as they can get you practice, as well as give you exposure to others who might want to hire you to speak. Finally, your fee isn't the only thing to consider. If you have to travel, you'll want to find out if the event will cover your travel, lodging and meals. 4. Find groups that target your market to pitch your speaking idea. What associations or organizations does your target market belong to? Start by researching whether or not they hold events that you can pitch to speak at. Or you can pitch to speak at one of their meetings. If you’re a business-to-business (B2B) business, seek out professional networks such as your local Chamber of Commerce. Civic and social groups (i.e. the Lions Club) often have speakers. Adult education programs (check with your local university or community college regarding adult education), libraries, and community recreation centers also are places to check. 5. Get to know your client. Although you’ve pitched an idea that is targeted to your market, it doesn’t hurt to learn more about the organization you’ll be speaking to. Tailoring your speech to the group insures you’re giving your audience what they want. If you mention your host organization in your speech, you can encourage more bookings. For example, if you’re speaking to the Chamber of Commerce, you can mention other resources the chamber offers its members. 6. Prepare multiple learning tools (if you’re giving a informational or instructional talk). People learn in a variety of ways. Some are auditory learners, in which they only need to hear what you’re saying. But others need written materials, and some prefer both. Consider having an outline to help participants follow your talk. Be sure to include your business name and contact information on your handouts. If you can spare the expense, provide folders with your presentation outline, brochure and other materials about your business. 7. Prepare and practice your talk. To avoid being boring, infuse your talk with stories and anecdotes that highlight the message you’re trying to convey. Add humor to your talk to ease tension and add a little fun to your talk. Build in time for questions, unless the type of talk doesn’t allow for that. While you don’t necessarily have to memorize your talk, you should be extremely familiar with it so you can deliver it in a conversational manner, as opposed to reading it. Practice your speech in front of friends, peers or in front of the mirror. Record your speech to note any tics such as the overuse of “um” and other speech fillers. 8. Prepare audiovisual material. Slide presentations can turn your audience off, especially if it’s loaded with bulleted text. At the same time, it can be a great tool to make sure you and your audience are on the same page of the talk. Instead of using bullets and text, consider using visuals over words. There is a saying that a picture is worth 1,000 words, so maximize that. Choose quality photos or graphics that illustrate the concept you’re trying to convey. For example, using the virtual assistant idea, when discussing how overwhelmed a business owner is, you can use an image of a business person juggling a cell phone, computer, papers, etc. 9. Promote your talk. While the organization that hired you will promote the talk to its membership, you should also promote your appearance. Not only does it support the organization, but it can add credibility to your business and attract other organizations to hire you. Add the event information to your website, send a press release, and share it on social media. 10. Show up on time, appropriately dressed, and ready to talk. You have one chance to make a good first impression. Don’t squander it by being late or looking sloppy. 11. Engage in anxiety-reducing tactics if you’re feeling fearful about public speaking. If you’ve practiced and know your material, focus on your competence. Take deep calming breaths. Stretch to relieve tension. Smile during your talk. 12. Seek feedback from your audience and client. It can be hard to receive criticism but the best way to improve your speaking skills as well as your talk itself is through feedback. Public speaking can be fun! It's an excellent way to expand your business and it's one of the few marketing strategies you can get paid to do. 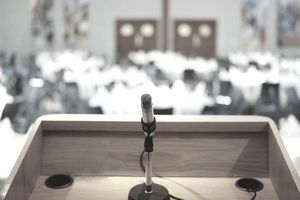 If you're feeling queasy about adding public speaking, consider getting help through organizations such as Toastmasters. Watch TedTalks to learn how to make an engaging and inspiring talk. Start small, by seeking to be on a panel or pitching small groups.